Animal advocates are vowing to fight budget proposals that could see tens of thousands of captive wild horses slaughtered as lawmakers prepare to consider the idea. The Bureau of Land Management (BLM), which is responsible for managing wild horses on the western rangelands, is seeking the right for the upcoming financial year to be able to sell the horses without limitation. Advocates fear such a change would result in thousands of wild horses being butchered. Its approval by lawmakers would mark a U-turn on the agency’s long-term strategy of mustering and holding the horses in captivity for the rest of their lives. The BLM’s management program for wild horses and burros has been under growing financial pressure, with a huge slice of its annual budget allocated to the ongoing care of wild horses kept under long-term pasturing contracts. Advocates have long been critical of the approach – as have scientists – with many arguing for better management on the range, including the use of birth control. On Wednesday, the Congressional Interior Subcommittee will consider the 2018 budget request that could see the animals go to slaughter. The Humane Society of the United States (HSUS) has voiced its opposition to the plan. It said the BLM had attempted for years to maintain stable populations by rounding up and removing thousands of wild horses and burros animals from the wild, despite repeated directives that it was leading the program toward financial instability. The proposal that could see the slaughter of captive horses was an effort to solve the agency-created financial crisis. Gillian Lyons, the society’s senior wildlife fertility control policy manager, described the proposal as an unconscionable betrayal of the American public. She said the Department of Interior had clearly signaled its intent to strip protections for wild horses and burros. The HSUS has long recommended the use of on-range management programs throughout the West. Its president and chief executive, Wayne Pacelle, described mass slaughter of the horses as a dreadful idea that flew in the face of the now longstanding prohibition on slaughter. The American Wild Horse Campaign, which also stands in opposition to the proposal, says Wednesday’s hearing before the subcommittee will provide the first insight into where House members stood on the controversial budget request. It said it hoped that the subcommittee, chaired by Rep. Ken Calvert (R-CA), would reject the proposal. It says the fight would be far from over, even if the proposal made it through the subcommittee. After subcommittee markup, the bill will go to the full House Appropriations Committee for consideration and approval. The bill will then go to the House Floor for a vote. The 2018 Interior spending bill will also have to make its way through the Senate. The organisation says America’s wild horses had many powerful allies in the Senate, including Diane Feinstein (D-CA) and Tom Udall (D-NM), who have always stood strong against slaughter, as has the chair of the Senate Interior Appropriations Committee Senator Lisa Murkowski (R-AK). “So, even if the House Interior Appropriations Subcommittee strips the slaughter ban from the 2018 spending bill, we have other chances to defeat this devastating legislation and restore the protections for our wild horses and burros that have been in place for almost 50 years,” it said in a statement. The Wild for Life Foundation and Saving America’s Horses also voiced their strong opposition to the killing of wild horses and burros. The organisations said they were against the removal of the protective language which currently restricted the sale of wild horses and burros by the BLM for slaughter. They said they applauded the many lawmakers in the Senate and the House who continued to support the needed protections for America’s wild horse and burro population. Both groups said the public should not to be duped by the clever and misleading “BLM propaganda”. “Selling the animals ‘without limitation’ or under sale authority effectively strips their protection from abuse and slaughter. 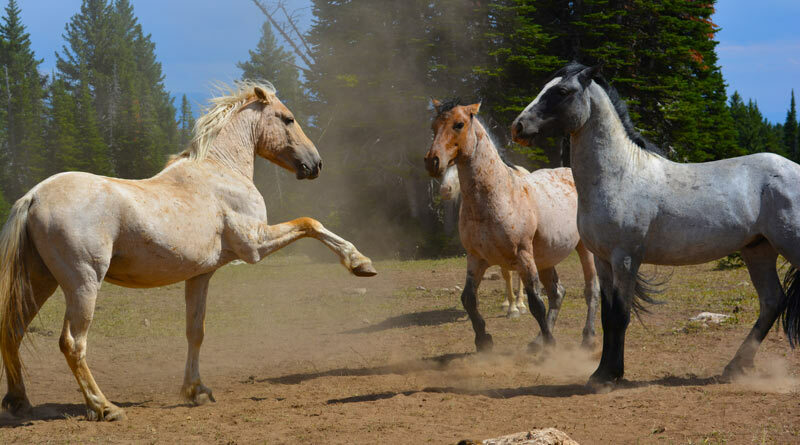 Ginger Kathrens, the executive director of the Colorado-based Cloud Foundation, in a recent opinion piece in the Star Tribune, said Americans did not want to see the horses slaughtered. She argued that better options existed. “Many ranchers who graze cattle on public land view wild horses as competition and support roundups that inhumanely remove horses from the range. The American public wants the herds preserved and treated more fairly. Navigating any middle ground between these two sides is difficult. “One thing that would help is a thoughtful, research-based approach to federal land management. The amount of acreage available to wild horses over the past few decades has dwindled, based on land-use allocations made by the US Bureau of Land Management,” she noted. She acknowledged that alternatives to wild horse roundups and removals were needed. Kathrens argued for the use of the PZP contraceptive vaccine, which she said allowed for safe, effective, inexpensive and humane management of wild horses on the range. She pointed out that nearly 40 groups, including the HSUS, had called on the BLM to increase appropriate use of fertility control.